Admission to a graduate occupational therapy (OT) program is becoming more competitive. You've already chosen your major, figured out what observation hours are, and now you're trying to figure out that last boost to your OT school application. As a prospective OT student, you must include relevant experiences and skills in your application in order to set yourself apart from other students. Ideally, this experience will communicate your interest and exposure to skills related to OT. Rather than holding a job as a cashier or sales clerk, here are suggestions for jobs you can hold while in school to boost the quality of your graduate school applications. A personal care aide is an individual who assists adults or older adults with tasks they need to complete every day. As an aide, you will help older adults complete many tasks—generally, any task for which they would need assistance. You will help older adults get dressed in the morning, get ready for bed, take showers, get to dinner, and, a fan favorite, go to the bathroom (yes, sometimes including clean up!). Typically in an assisted living facility, an aide will help older adults with activities of daily living (ADLs), which include dressing, toileting, bathing, and transportation. These are examples of skills in older adults that an occupational therapist will address in a rehabilitation setting. To me, there is nothing better than listening to the many funny, insightful, and educational stories these older adults share about their lives and another time. As my first job, this was a challenging and rewarding position that helped me develop a passion for working with older adults. This job is a good way to boost your application because it fosters resident communication, assistance with OT related issues such as ADLs, and use of assistive technology put in place by OTs. To find a job as an aide, you can look for job postings as a personal care aide or those posted by assisted living facilities that do not require additional certification. Other opportunities for aides that require additional certification and training include Certified Nursing Assistant (CNA) and Home Health Aide (HHA). An activities leader leads both group and individual activities in settings including skilled nursing facilities, assisted living facilities, adult day cares, and group homes. These are the staff who bring residents to music programs, cooking activities, and of course playing bingo! Some additional duties an activities leader could be expected to perform include transporting residents to and from activities, set up and clean up of activities, and interviewing residents to address activity interest. In reviewing an application, admissions faculty will see that you were able to facilitate participation in a planned activity for older adults or individuals with intellectual disabilities. My experience as an activities leader in a skilled nursing facility helped further improve my communication and observation skills with older adults and staff, in addition to figuring out how to target residents’ interests and motivate them to engage in activities. This promoted my abilities to be client-centered to include activities that are interesting, important, and help older adults feel successful. In-home child care, otherwise known as babysitting, provides experience working with children, understanding motivation, observing function, and communicating with parents. Throughout college, I had several peers who worked as part-time babysitters to typically developing children as well as children with disabilities including Cerebral Palsy, ADHD, and Autism Spectrum Disorder (ASD). This experience has helped my peers to understand the functional deficits that a disability might incur on a child and family. In this position, a student may be more comfortable in working with these populations and have insight into successful performance in their everyday activities. Similar to the babysitting opportunities, students working in a daycare will gain similar experience in working with children. This opportunity may provide additional experience in working in a team model, coordinating several children at once, and leading group activities at appropriate developmental levels. A position as a summer camp counselor can give you unique experiences working with children. In addition to the similar experience you’d acquire working in a daycare, a summer camp counselor may be provided an opportunity to observe campers’ ADLs around the clock. This can increase use of observational skills to address sleep hygiene and environmental and social factors that interfere with campers’ abilities to participate in activities. Several of my peers volunteered at camps geared towards individuals with disabilities. One in particular was a camp designed for individuals with Tourette’s syndrome. Participating in this camp helped my peers to gain a more complete understanding of the effects of this disability on performance in regards to social relationships, task performance, and self-care tasks. My peers were able to learn how Tourette’s syndrome affects the campers and how to successfully assist these individuals in order to have meaningful and fun experiences at camp. Working at an after-school program provides another opportunity to work with children and adolescents. This setting may allow for different experiences including helping with homework, leading group activities, or participating in leisure or play activities. After-school programs offer the opportunity for students to work with children and adolescents in explaining tasks such as homework directions in a way that is helpful and meaningful for the individual. 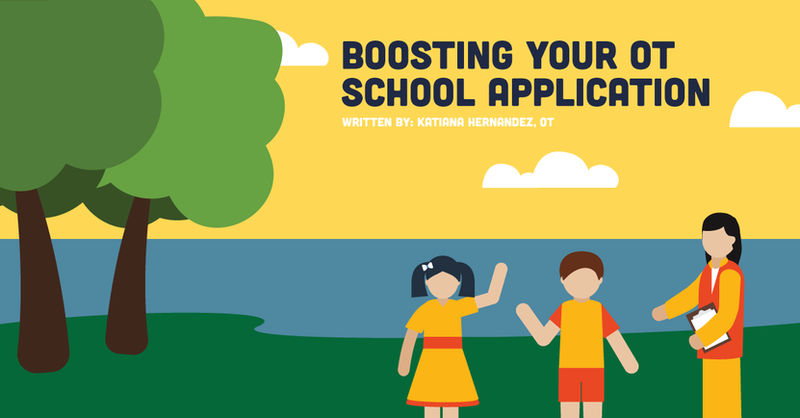 By working in after-school programs, students also learn how to assist children and adolescents in finding meaningful solutions to increase understanding performance in social and school roles. Working as a rehab aide provides opportunity to be a part of the rehabilitation team to provide transportation, clean equipment, and implement walking programs. Working in a rehabilitation unit allows a student to develop patient communication, observe direct therapy services, and determine if that setting is a good fit as a career. Last but not least, there are many volunteer opportunities that offer good experience for students applying to and completing a graduate OT program. Volunteering in sensory gyms, nursing homes, adult day cares, hospitals, and programming targeted towards individuals with a disability can help increase skills such as communication, teamwork, and observation that are all important in becoming a successful clinician. When preparing to apply to a graduate OT program, a student must consider what factors set them apart as the best candidate in this increasingly competitive field. Experiences including volunteer work and job positions should reflect motivation and interest in pursuing a career as an occupational therapist. Students should reflect on experiences to decide whether they would impress the admissions faculty to be chosen to enter an OT graduate program.